Today’s public sector employees function in a highly complex fishbowl environment, complicated by political leaders and public managers broadcasting their opinions in 140 characters. Sacrificing substance for splash, we’ve entered an era that may be marking a pause in our progress toward deliberative evidence-based public service. But how best to consider this? Perhaps it is time to consider a new model of the environment facing public managers today to ground our actions. To this end, we’ve adapted John Gaus’ spheres of influence to frame our current environment. 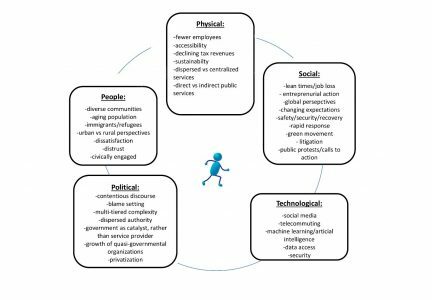 Applying these spheres of influence, we’ve updated the people, place, technology and change concepts to illustrate the modern environment in which public managers find themselves attempting to manifest their public service mission. Public managers are operating amid increasing public dissatisfaction and political grandstanding Gallup Poll 2017. This rising dissatisfaction can be seen in wide-spread public protests with great passion, but limited impact New Yorker Protesting 2017. Recently we have seen widespread challenges over funding public pensions and experienced how the Occupy movement linked social media and citizen engagement Public Pensions 2017. We hear calls for the nebulous phrase “less government” amid demands for governmental deregulation Less Government 2017. Combined with high profile private sector failures, high profile public bail-outs, and inadequate job creation, it may be time to consider what this means for the public manager’s changing environment. Clearly, public managers function in a dynamic environment in which the complexity of the environment grows with our population. Ultimately, do these stressors (or the impact) of the spheres of influence (environment) contribute to dissatisfaction — both of and by the public manager? The increasing impact of globalization, social media transparency and watchdog vigilance facing public management has been exacerbated by austerity measures and continuing skepticism of public employees at virtually every level of government. Indeed, news travels faster than ever before with social media and allows everyone “direct” contact with their government official. As a response to the 2016 elections, the Indivisible Movement was formed to resist the Trump agenda. Americans took on an activist role, using social media to pass along local public official contact information, rallying their networks to engage. Since then, democrats have flipped two seats in state special elections Indivisible.org. The ubiquity of social media as a direct interaction tool and popularity barometer is certainly changing the nature of public management interactions. Foreign governments have been alleged to have intervened in public discussions via social media, hoping to influence American citizens’ interactions with public officials. Russian factory trolls are propagating false information, and their efforts have been linked to our current politics Factory Trolls. Clearly, the complexity of the modern public administration environment is vastly different from any other generation. In this wide-open fishbowl environment, how can the public administrator best function? Figure 1 provides a model for the contemporary public management environment that should help provide a theoretical underpinning for understanding the complexity of today’s public management. 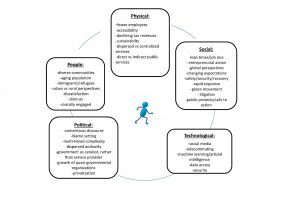 Figure 1: An Interpretation of Gaus’ Five Environmental Spheres of Influence on Public Administration as Reconsidered for the 21st Century. Understand how the five spheres of influence interact and affect day to day public management. Practice reflective public management that considers the context of public action. Create transparent and open communication and information wherever possible. Establish prospects for effective civic engagement within communities. Push out evidence behind policy decisions directly to citizens to build awareness and inform discourse. It is time to consider developing new tools to reverse the dissatisfaction and blame laying that is currently pressuring public managers both internally from above and externally from citizens. If we are on the brink of a paradigm shift, it is possible that extreme political rhetoric is the last paroxysm of the old dying paradigm. Perhaps politicians and public administrators will recognize and respect the new, complex environment in which they find themselves operating. 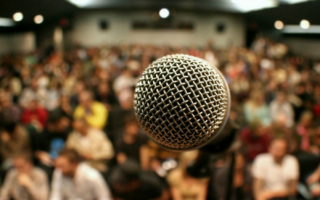 In turn, they may learn to connect with citizens for the purpose of true “engagement” and deliberative discourse. Perhaps these new conversations and pathways for communication and knowledge generation may in time lead to a new paradigm that reflects true equality for all within a more power neutral setting. Only then may we see the way forward for conducting the business of government.